A second application of in-crop herbicide is not always economical if the crop is well established, competitive and ahead of the remaining weed population. …If growers use canola as a clean-up crop for narrow-leaved hawk’s beard, round-leaved mallow, Group-1 resistant wild oats and other tough weeds, a second herbicide application may be required. Note that this cannot wipe out Group-1 resistant wild oats; it will only reduce the seed bank somewhat. …If weeds are plentiful, at the same stage or ahead of the crop and the canopy hasn’t closed, these weeds may have a large yield impact. 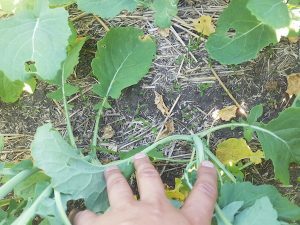 Note however that you’re still required to follow label rate directions for the sake of canola tolerance even if these large weeds might require a higher rate for control. A pre-harvest product is another option to consider. …If weeds are at levels too low to influence yield, but are potential grade impacting weeds — such as cleavers — a second spray may pay off if it can do a job on these weeds. Herbicide-resistant weeds are becoming a bigger challenge every year as the area taken up by resistant weeds continues to expand and new forms/types of resistance (weed species, herbicide groups) are discovered. Scout for suspect patches that should have been controlled but were not. Higher plant populations and narrow row spacing are two effective cultural practices that provide an alternative to herbicide or, at a minimum, reduce the need for multiple in-crop sprays. Also band instead of broadcast fertilizer. Broadcasted fertilizer benefits the weeds as much as the crop, whereas banding fertilizer close to the seed row is targeted more to the crop. For perennial weeds that have escaped but are delayed relative to the crop, growers may consider pre- or post-harvest glyphosate application as an alternative, especially if the weeds are delayed enough to avoid seed set prior to swathing. Another option, if you still haven’t made the first pass, is to use a higher registered rate the first time around.